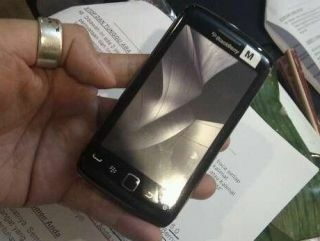 BlackBerry Storm 3 outed in spy shot? Storm in a three cup? An image has leaked of a new BlackBerry handset which looks like it could well be the upcoming BlackBerry Storm 3. The Storm series of BlackBerry phones are touchscreen-only devices and the BlackBerry papped by a reader of BerryReview is just that - coming equipped with a 3.7-inch display. Other specs are in short supply, but the tipster does reckon that the BlackBerry Storm 3 comes with a meaty 8GB of internal memory and has mobile Wi-Fi hotspot connectivity. RIM still hasn't quite got touchscreen nailed with the BlackBerry Storm and the Storm 2. The SuprePress click-screen function may have been tweaked for the Storm 2 but it was still a turn-off for many - although the BlackBerry Torch did go some way to fixing the touchscreen problems. Here's hoping that the BlackBerry Storm 3 is a decent enough touchscreen device to match the iPhone 4's and HTC Desire's of the world.